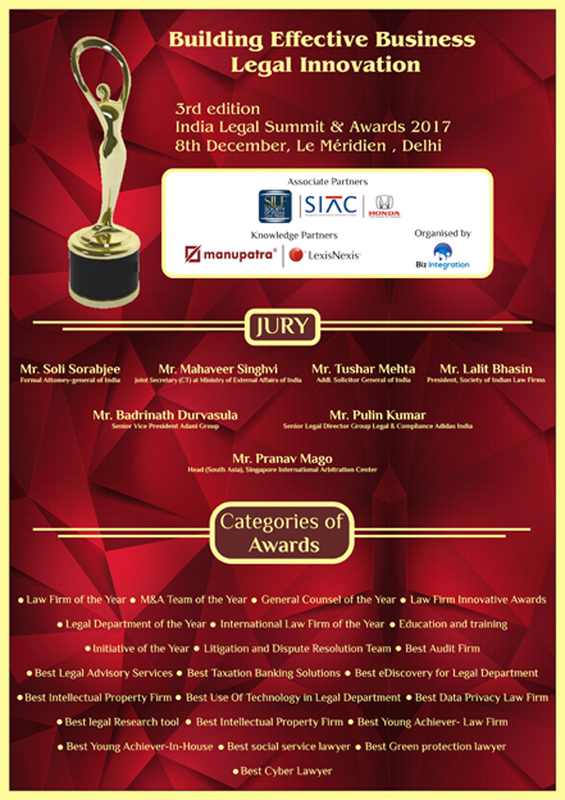 Biz Integration is pleased to present the 3rd edition of the India Legal Summit & Legal Awards 2017. The theme of the conference is 'Building Effective Business Legal Innovation'. The objective of the summit is to share ideas on India's legal framework of India, and provide strategies on efficiently managing legal strategy as a business process and witnessing assembly of the country's leading legal community. For each category, you need to register at least 1 delegate for the Award Function. Consolidation of all nomination forms and other information received from various organizations will be shortlisted according to the complete registration received and jury will evaluate the finalists and decide the winner in each category. The application deadline is 10th November, 2017.